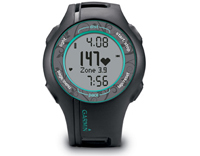 Garmin Forerunner 210 HR Teal (010-00863-39) €203.00 - buy online at mysatnav.ie - Ireland's leading GPS & Sat Nav store. If you need an accessory for your Garmin watch, please contact us, we stock the complete range. Call us on 01-2936987 or email us at enquiries@mysatnav.ie. Monitors time, distance, pace, calories burned and heart rate. Black face and strap, otherwise same specification. Special Edition colours, otherwise same specification. This Forerunner 210 is a mid-range GPS watch for both outdoor and indoor use. It tracks distance, time and pace and comes with a heart rate monitor for calorie computation. If you plan to use the watch in the gym you will need the optional footpod which you snap onto your shoe. The footpod collects distance and speed data that is 98% accurate for most users straight out of the box. Another useful feature is that the 210 also works with certain indoor fitness equipment such as treadmills and cycling equipment that is Ant+ compatible.